BRANDON — King needed just needed one out. But with the way the Saladino Tournament championship game against Alonso had unfolded up to that point, nothing was guaranteed. Up by a run with Ravens on second and third, assistant coach Anthony Macaluso approached the mound to check on pitcher Josh Keding, still unsure what he was going to do. 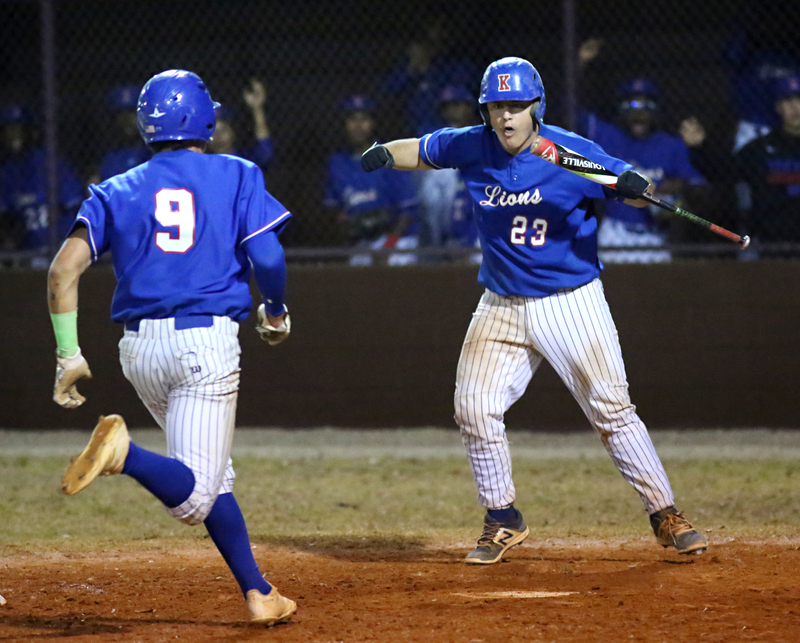 He hadn't pitched in a game in more than two years, but all tournament long, Lions shortstop and leadoff hitter Addison Barger had been itching to take the mound in a big moment. So as they met at the mound, Macaluso asked the senior if he was ready. "He goes, 'Coach, I'm 1,000 percent sure I can do this,'" Anthony Macaluso said. "And the rest is history." Barger, who was named the tournament MVP, struck out the final batter looking, giving King a 6-5 victory — its first Saladino Tournament championship since 1992. It wasn't a flawless win. King walked nine batters, and Alonso led for most of the evening. But when it mattered most, Anthony Macaluso said, the Lions pulled through. "When you're on your sixth day with pitching depth … the runs on the scoreboard at the end of the day are what matters," said Macaluso, who coached for father Jim Macaluso after he was ejected from the semifinal game earlier in the day. "We turned some double plays, we got some breaks. That's what these games are all about. You're on your last effort, last gas, last arm, and we pulled it out." The Lions, who beat Sickles 12-8 in the semifinal earlier in the day, had pitching trouble early and trailed 3-0 after the first inning. Keding, who hasn't pitched for King all year, came in with two outs in the first and gave up just five hits through the sixth inning. The Ravens (8-4) found a way to take bases, though, thanks to walks. "It's all cliche stuff, but they don't give up," said Jim Macaluso, who's in his 43rd season coaching the Lions. "Offensively, when they're down, they get behind, you can feel it. For a high school team, you don't usually get that, but you feel confidence in the dugout." Twice, the Lions (9-1-1) rallied from behind, tying the score in the third and sixth innings. But with two outs in the sixth, King kept going, and Zarrian Brinson knocked in the go-ahead run on a single, advancing to second on an error. In the next frame, Alonso put the tying run in scoring position with a Nick Gonzalez double, but Keding got out of the jam, getting his fourth strikeout to end the inning. After Barger scored an insurance run for King on a wild pitch in the top of the seventh, Alonso tried to answer. The Ravens, who have played in the Saladino Tournament final each of the past four years, scored a run on an RBI single in the bottom of the frame. But with two runners in scoring position, Barger answered the call he'd been waiting for to strand them for good. Barger, for his part, knew just from where the motivation came. "When (Coach) got ejected, it just gave us more fuel for the fire, kind of," he said. "That's what it does to the players. We want to win for him, so that's what we did." After the Lions dogpiled on the mound, they made a mad dash for outfield fence, behind which coach Jim Macaluso was waiting out the game. Many of them scaled the 10-foot fence to celebrate with their coach. "I teared up," Jim Macaluso said. "It was special."